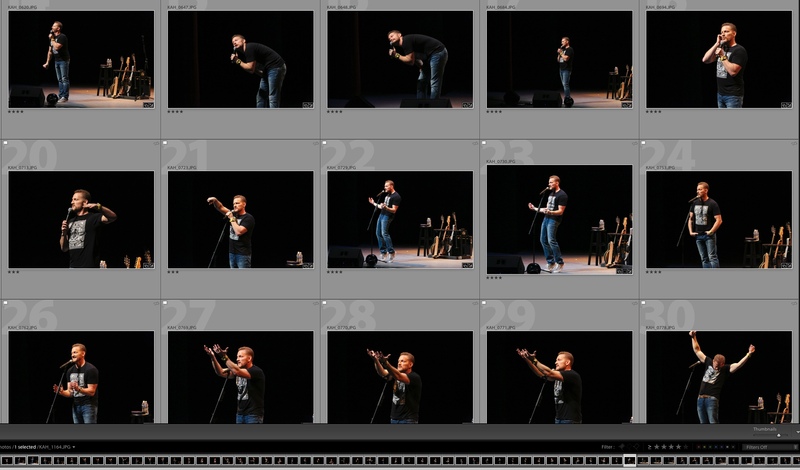 It’s difficult to photograph many types of shows… stand-up comedy and funny plays can actually be on the list of those problem shows to shoot. 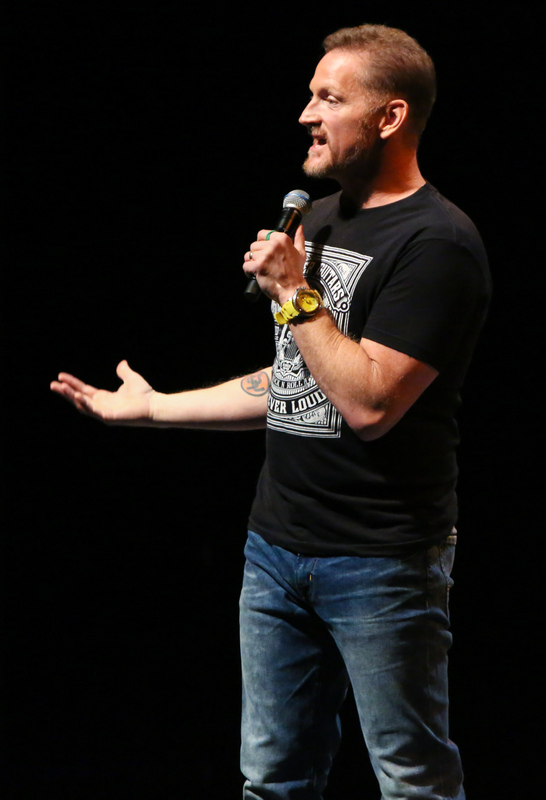 We cov­er some very fun­ny talks and shows that don’t real­ly look fun­ny. Often what’s going on is that the audi­ence is laugh­ing AT some­one who’s being the straight man, look­ing seri­ous, and maybe awk­ward. 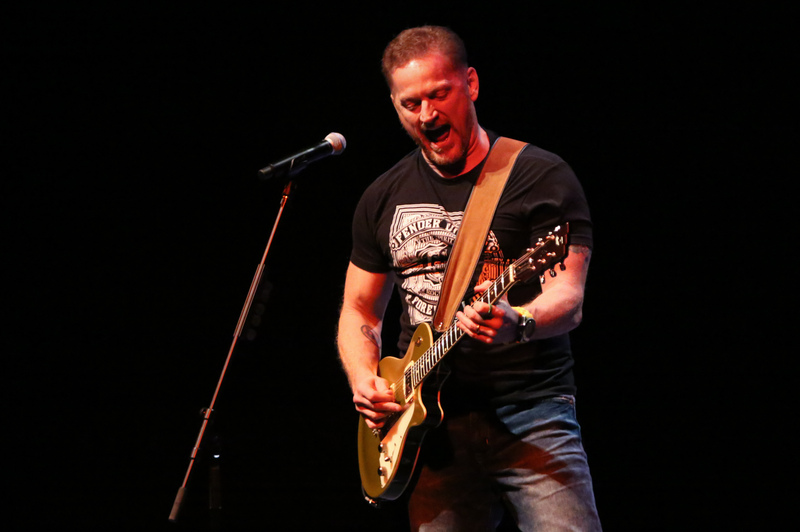 For­tu­nate­ly for my biggest name com­e­dy shoot for DPAC —Tim Hawkins looks fun­ny [insert your own joke here ] as he’s doing the show. But seri­ous­ly, with lots of phys­i­cal humor, rock star pos­es with his gui­tar, and a rub­ber face, you can tell at a glance he’s get­ting the laughs. The only snag is, like most con­cert shoots, you only have the first 10 min­utes or so to nail your shots. So you’re bound to miss some great mate­r­i­al with a com­e­dy show. I had 15 min­utes or so at the top of Tim’s show, and I think I got enough vari­ety to be a sol­id edit for my client (and Tim also wants the images, which is cool). You can see some of my thumb­nail images above, as I’m in process of nar­row­ing down which are the strongest. See more of my the­atre and dance work HERE. We cover all sorts of theatre and concert events. Give us a shout to chat about your show coverage.